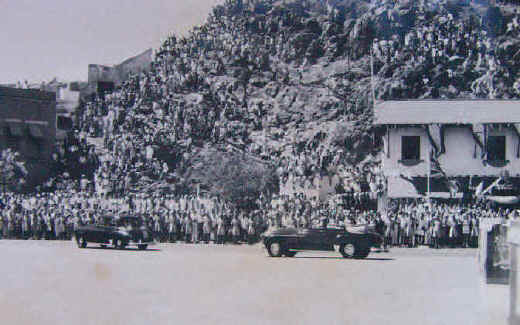 In the year of Her Majesty Queen Elizabeth’s Diamond Jubilee, the following article recalls highlights of her visit to Aden in 1954. We are indebted to Dr Carol Downer for all but one of the b/w illustrations which accompany the text. These have been reproduced from the commemorative album belonging to her father, the late Air Marshal S.O. Bufton, who was closely involved with the Queen’s visit. Queen Elizabeth’s first pictorial association with Aden dates from June 1953 – the month and year of her coronation – when a new set of Aden colony stamps was issued bearing her profile surmounted by the Royal Crown. This issue was printed in East African currency (cents and shillings) which in 1951 had been adopted in place of the previously used Indian currency (annas and rupees). 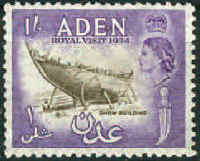 The stamps depicted a variety of local scenes, including the Colony’s emblematic dhow; and for the first time the toponym of Aden and the value of each stamp were printed in Arabic as well as in English. The Coronation on 2 June 1953 was commemorated by the issue of a special 15 cent stamp with a medallion portrait of the Queen engraved in black, a design shared by colonial territories throughout the empire. Similar commemorative stamps were issued for the only two Aden Protectorate states which ran their own postal services: the Qu’aiti and Kathiri sultanates. This was an exceptional philatelic initiative because all previous and future Qu’aiti and Kathiri stamps bore portraits of their respective rulers, not that of the British sovereign. The Royal visit to Aden in 1954 was modestly marked by the re-issue of the 1953 one shilling stamp (featuring dhow-building) with an added inscription recording the event. 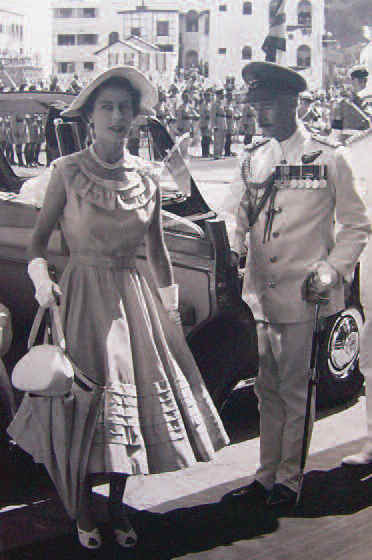 The Queen’s hitherto pictorial and symbolic link with Aden became a spectacular reality on 27 April 1954 when she and the Duke of Edinburgh arrived by sea in S.S. Gothic on their way back from Australia and Ceylon. 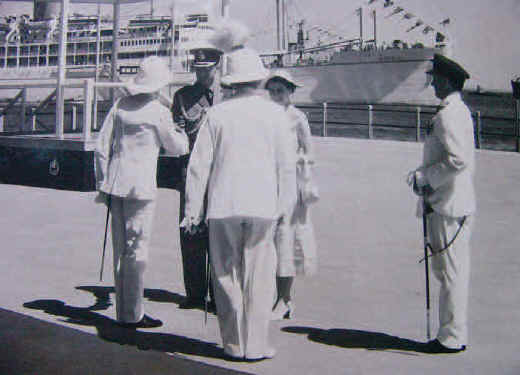 They stepped ashore at the Prince of Wales Pier where they were greeted by the Governor of Aden, Sir Tom Hickinbotham, his Chief Secretary, E.D. Hone, and Air Vice Marshal S.O. Bufton, the Air Officer Commanding, Aden (1953–55); since 1928 responsibility for Aden’s security had been vested in the Royal Air Force. Large crowds had gathered near the Pier and on the hillside opposite, and the whole area between the Pier and the Crescent was festooned with flags, bunting and decorative arches. From the royal dais in the Crescent, flanked by stands and enclosures packed with spectators, the Queen watched a military parade including units of the RAF, Aden Protectorate Levies (APL), Armed Police, Government Guards, Hadhrami Bedouin Legion (HBL), and Somaliland Scouts. The royal couple then inspected the parade from an open Land Rover. The Queen must have been struck by the ethnic diversity of the crowds which had gathered to see her. Having returned to the Royal enclosure, the Queen listened patiently to loyal addresses read by members of the Executive and Legislative Councils, and to a speech of welcome in Arabic made on behalf of the Protectorate chiefs by the venerable ruler of the Qu’aiti State, Sultan Saleh bin Ghalib (d. 1956). An English translation of his speech was then read by the young, charismatic ruler of Lahej, Sultan Ali Abdul Karim Al-Abdali. In what will have been the first and last occasion of a royal investiture in Aden, the Queen knighted Air Marshal Sir Claude Pelly, KCB, Commander-in-Chief of the RAF in the Middle East, and next, Sayyid Abu Bakr bin Shaikh al-Kaff, KBE, for his public services as peacemaker and philanthropist in Hadhramaut (Eastern Aden Protectorate). Sayyid Abu Bakr (d. 1965) had earlier declined to kneel to receive his accolade from the Queen on the grounds that as a Muslim he could only kneel before the Almighty; however, as a compromise, he agreed to stoop. On being 32 honoured with a KBE in 1953, he had also declined to surrender the CBE awarded him in 1937 (as protocol required him to do on attaining a higher rank within the same Order), commenting that what the British gave with one hand they sought to take away with the other! The Queen later visited the 180-bed RAF hospital, perched on Barrack Hill above Steamer Point. Ventilated by sea breezes, with its high ceilings and deep, shaded verandahs, the hospital provided welcome relief for patients and staff, from Aden’s heat and humidity. Next, a small lunch at Government House attended by expatriate and Adeni dignitaries, with the Qu’aiti and Lahej Sultans representing the Protectorate. After retiring to the Gothic to rest, the Queen, later that afternoon, embarked on a tour of Ma’alla and Crater through densely packed, cheering crowds. At the football ground 4000 schoolboys were waiting to greet her, and at the Intermediate School playground 2000 schoolgirls were vying with the boys in lung power. People ran beside her car, and the local police had some anxious moments. The enthusiasm with which she was received in Crater delayed her programme by some twenty minutes. Her next engagement was to lay the foundation stone for the new 490-bed civil hospital in Khormaksar, which was to bear her name until independence (Princess Alexandra was to visit the hospital, by then fully operational, in 1961). The Queen then proceeded to Sheikh Othman to attend a garden party given in her honour by the Governor. During the afternoon the Duke of Edinburgh had travelled by launch to Little Aden to view the new BP Oil Refinery whose construction, begun in November 1952, was now almost complete and would transform Aden into one of the largest bunkering ports in the world. The refinery and its tank farm covered 270 acres of largely reclaimed land and was initially designed to process five million tons of oil a year; it would be commissioned in July 1954. Sheikh Othman, the venue for the Governor’s reception, was a township and oasis at the crossroads of the Colony and its desert hinterland. Its main attraction was its extensive municipal gardens with their shade trees and beds of flowering shrubs. Here some 400 guests had assembled to greet the Queen. Seated on carpets, Protectorate chiefs, in their variegated robes and turbans, presented a kaleidoscope of colour matched only by the brilliant saris of the Indian ladies present. At a special enclosure the Queen was introduced to purdah wives. More than half a century later a spectator recalled: ‘[the Queen] was looking particularly beautiful, obviously very happy after the great reception she had had in Crater, not only from the schoolchildren whom she had gone to see but also from the crowds along the route. As in the morning, she looked completely in control – assured’. After the garden party the Queen and the Duke returned to Steamer Point, made their farewells and retired to the Gothic until the early hours of the following morning when they flew from Khormaksar to Uganda. The Gothic had been hired for the Royal tour because the Royal Yacht Britannia was not yet ready for use. Britannia (without the Queen) did however pay an unscheduled visit to Aden in early 1986, following the outbreak of a brief but bloody civil war in South Yemen, to provide a safe haven for expatriates fleeing the violence. The latter included Soviet Bloc advisers, and the irony of the Royal Yacht , during the Cold War, rescuing them from a conflict perpetrated by their own clients was not lost on observers. During the 1990s an imaginative but implausible myth was to gain currency that the Queen had spent the night of her 1954 visit in the then prestigious Crescent Hotel. After years of neglect under state ownership, the hotel had been refurbished by a local entrepreneur, and a ‘Royal Suite’, complete with a colour photograph of Her Majesty, had been added to the hotel’s advertised but still limited amenities. If the Gothic had been unavailable to the Royal couple they would surely have spent the night at Government House. The Queen’s message of thanks to the Governor and to ‘all those who helped to make our visit so memorable and so successful’ reflects the relatively buoyant, if transient, mood of the day. Her visit was happily timed. 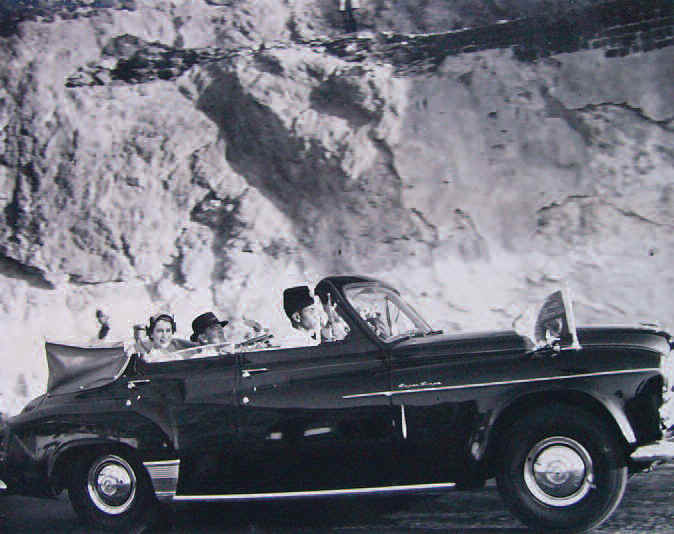 Aden was in the heyday of its prosperity. Local politics had yet to ruffle the outward calm of the Colony with its vibrant, polyglot population. The Suez crisis of 1956, which was to irreparably sour Britain’s relations with the Arab world, still lay in the future.